The 72nd edition of the Sydney-Hobart race has been a complete success for the Juan Kouyoumdjian design studio, both in corrected time and elapsed time. 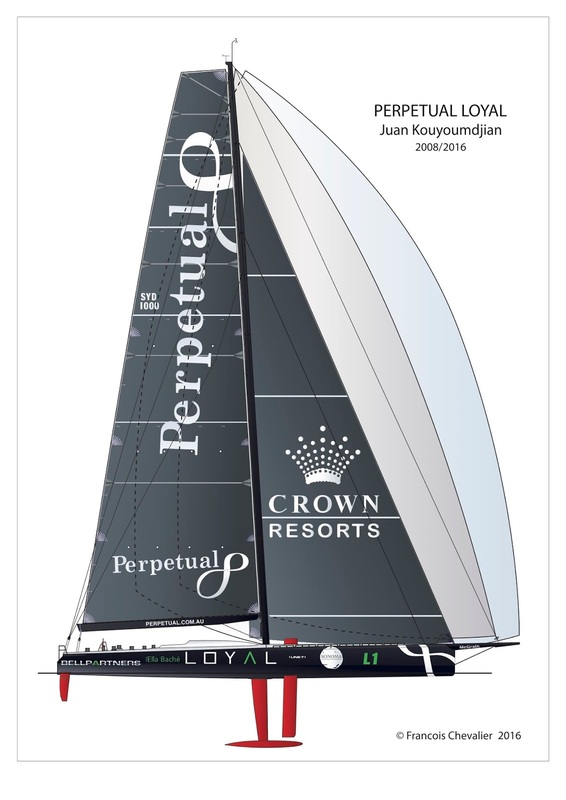 Perpetual Loyal set a new record of 1 day, 13 hours, 31 minutes and 20 seconds, breaking the previous record of 1 day, 18 hours, 23 minutes and 12 seconds held by Wild Oats XI since 2012; An impressive gain of 4 hours, 51 minutes and 52 seconds. In corrected time, Perpetual Loyal arrived in second place. Perpetual Loyal, ex Rambler 100 ex Speedboat, had been purchased by Australian accountant and yachtsman Anthony Bell, who had previously won line honours in the 2011 edition of the Sydney Hobart race, narrowly beatingWild Oats XI by 3 minutes and 8 seconds on another boat, Investec Loyal, ex Maximus, a 2005 Greg Eliott & Clay Oliver design. 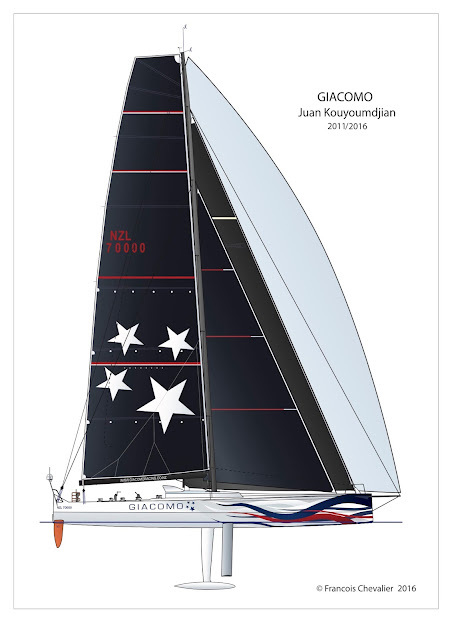 This Kouyoumdjian design, launched in 2008, seemed really extreme at launch; Half her displacement is located in her canting keel, which can be rotated to windward. 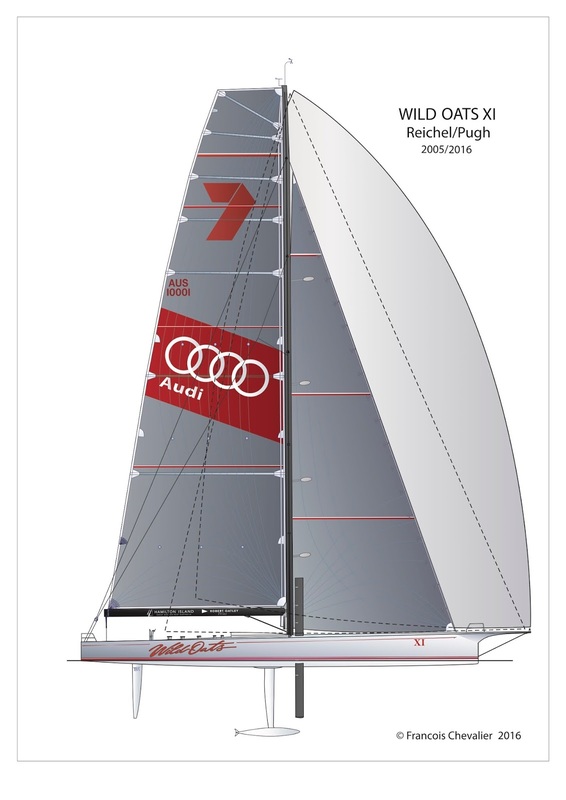 This year, Anthony Bell hired Olympian gold medalist Tom Slingsby as his relief helmsman and co-skipper, as well as navigator Tom Addis, and the following crew: Tony Mutter, P. Arrarte, R. Sutherland, B. Kellett, J. Clougher, E. Molan, A. Mons, M. Parker, T. Oxley, J. Flannery, N. Dana, C. Nicholson, P. Caligeros, J. Akacich, A. Pratt, C. Maxted and J. Winning. In corrected time, the Tattersall Cup was handed to Giacomo, ex Groupama 4 (winner of the 2012 edition of the Volvo Ocean Race), acquired in 2013 by New Zealander Jim Delagat, owner of the Delagat Wine Estate. She arrived in Hobart in second place on elapsed time, less than two hours behind Perpetual Royal and ahead of the previous record held by Wild Oats XI. The yacht had arrived in sixth position in 2013. Scallywag ex-Ragamuffin 100 was third across the finish line, just 2 minutes and 10 seconds behind Giacomo, and sixth on corrected time. The Ragamuffin yachts are an intricate part of Australian yachting history; Their owner Syd Fisher has taken part in the Sydney Hobart race 46 times, and earned countless prizes since the first Ragamuffin in 1968. Designed by Andrew Dovell, Ragamuffin 100 is first and foremost a compromise yacht, competitive in all weather conditions, including light winds. 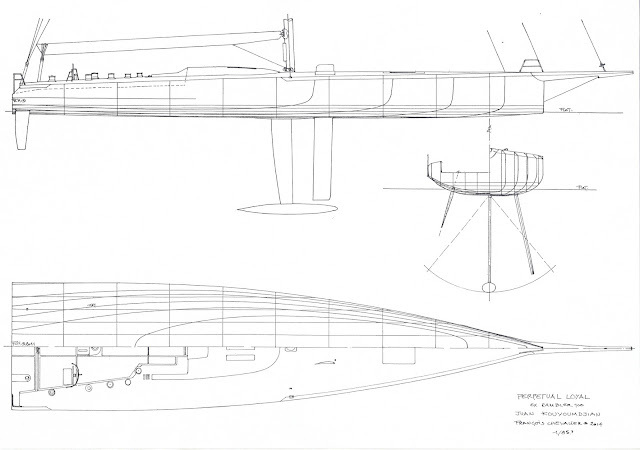 Her hard-chine bilged hull is not exceedingly wide, features a short and flat waterline, as well as water ballasts to adjust heel angle and pitch angle. Her new owner Seng Huang Lee, from Hong Kong, hired skipper David Witt and his crew to sail the yacht in this year's race. 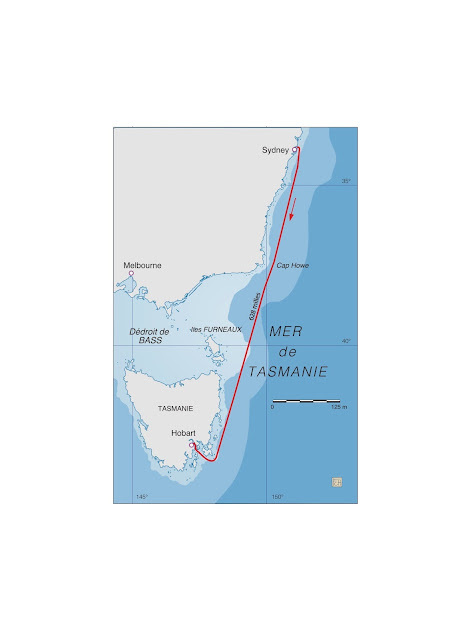 Wild Oats XI, always slippered by Mark Richards, was not able to complete the course this year because of hydraulic keelram problems, despite leading the fleet at Flinders Island, north of Tasmania. Launched just three weeks ahead of her inaugural Sydney-Hobart race in 2005, Wild Oats XI was able to dominate all her opponents in her first season. Since then she has collected enough silverware to appear invincible: ten Sydney-Hobart line honours, amongst which two trebles (winning both Illingworth and Tattersall Cups as well as setting new records) Since 2005 she has undergone continuous appendage modifications to improve her performance: originally a canting-ballast-twin-foil, her forward canard was removed, she was fitted with two midship daggerboards as well as a bow centerboard and a horizontal lateral retractable foil amidships in 2013. She underwent a complete hull surgery at the McConaghy yard in 2015, where she was topped 10 metres at the bow and tailed 2 metres at the stern in order to sleeken her waterlines and deepen her bow. 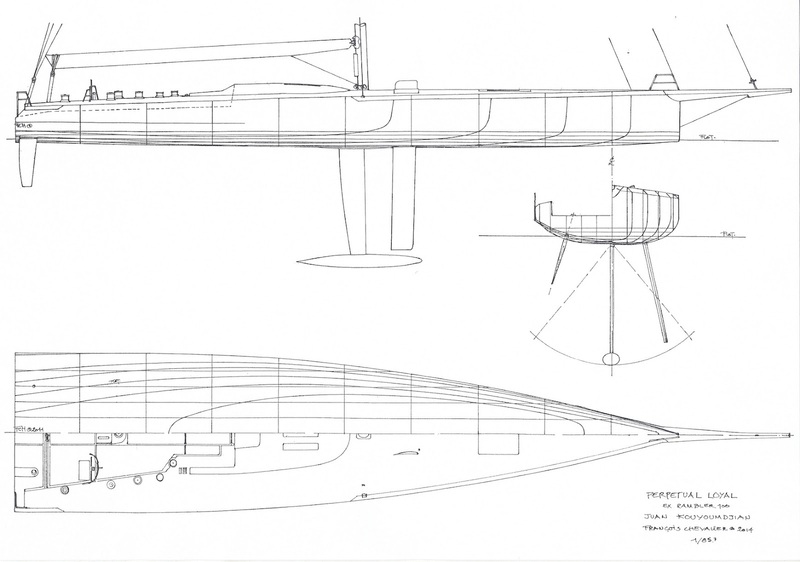 Her bowsprit was lengthened by 75cm in order to carry up to 600sqm of light wind head sails. The horizontal foils were removed this year to save weight, as they were no longer deemed efficient with the new bow. 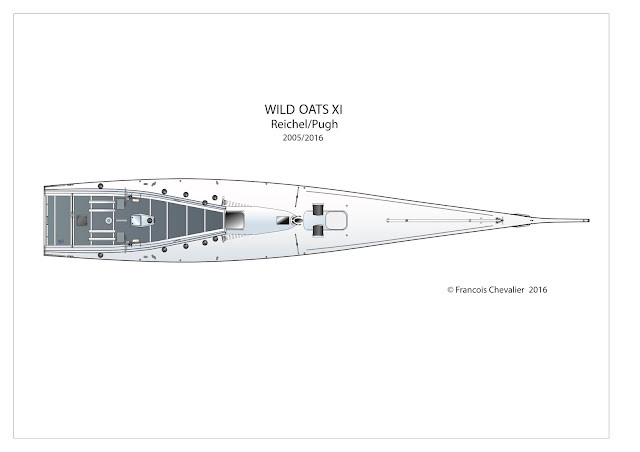 The new lines of Wild Oats XI feature a hull with a slightly more rounded bilge, flaring topsides, an extremely sleek and narrow waterline (4.10m). 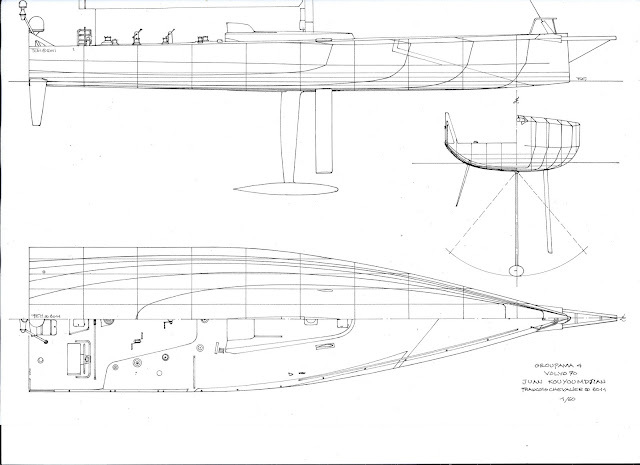 Notably, the centerline of this narrow hull barely changes as the yacht heels, allowing for excellent upwind capability. In November, CQS took line honours and set a new record at the Royal Akarana Yacht Club's Round White Island Race. However, due to problems hydraulics and foils already at the start line, CQS only finnished in seventh place, and 63rd overall, but seems determined to take part in the race next year.